Here are 10 of the most common plumbing emergencies. You’re doing the dishes in the kitchen or brushing your teeth in the bathroom and the sink refuses to drain. A slow drain is annoying, but it’s not necessarily an emergency. However, if the clog becomes severe, water flow may stop completely, which could cause a serious slow down of your daily activities. Is your toilet clogged, making weird noises, leaking or refusing to flush? 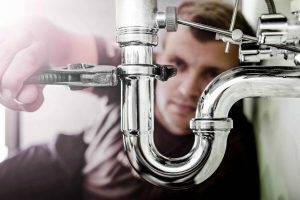 Since the toilet is the most used fixture in your home, any of these common plumbing emergencies are enough to ruin your day. Try some DIY tips for unclogging the toilet, but remember an unresolved problem can allow leaks to cause structural damage or raw sewage backups to present health hazards. You’re taking a shower and the water starts rising to your ankles, or a strange gurgling sound comes from the drain. Soap scum and hair buildup are the most common reasons behind this plumbing emergency. The constant drip is enough to annoy you, but leaky faucets and toilets can also rack up your water bills, cause rust to form and facilitate mold growth. If you discover a leak or other problem interrupting your hot water supply, you could be wasting a lot of money on water heating. A leak can also cause property damage. A leaky water heater valve can be easily replaced, but if the water heater wall has completely rusted through, you need an entirely new water heater to overcome the problem. Washing machines are sturdy, durable appliances, but the water hoses are often the weakest link. If you discover a cracked or bulging hose behind the washer, don’t ignore it or mold and rust could become serious problems. Tree roots, earthquakes, and poorly aimed shovels can cause underground water lines to break. This can cause soggy areas in the yard, poor water quality and no or very low water pressure. The freeze-thaw cycle can cause exposed pipes to burst. This problem could turn a complete pipe replacement, which would need to be handled by professionals. It’s what nightmares are made of: you hop into the shower and soap up with your favorite body wash when suddenly the water goes ice-cold. You could be experiencing a water heater malfunction, electrical issue or plumbing leak. Then again, it could be your utility company’s fault that you have no hot water. It’s another plumbing nightmare no one wants to experience. Sewer backups are messy, costly and inconvenient, to say the least. Signs of a sewer system backup include multiple drain clogs, bad sewage odors coming from the drains, gurgling toilets, and water pooling around the basement floor drain.